It’s been half a decade since Tall Heights kicked off their career in Boston’s Faneuil Hall, busking for more than 100 days to help fund their very first EP. Paul Wright would play cello, Tim Harrington would strum the acoustic guitar, and both bandmates would sing, their voices cutting through the noise of shoppers and tourists. Since those days, the duo’s harmony-heavy indie folk has taken Tall Heights from the marketplaces of Massachusetts to stages across the country. They’ve toured America, released critically-acclaimed album, Man of Stone, and earned a spot on the same folk family tree as Simon & Garfunkel and Bon Iver. On 2015’s Holding On, Holding Out, though, the duo widen their reach significantly, beefing up their sound with electronics, synthesizers, drums loops, Casio keyboards, and plenty of shimmer and shine. It’s a record of exploration and expansion, with Tall Heights building something towering on top of their folksy foundation. Recorded at Color Study studio in Goshen, Vermont, Holding On, Holding Out was partially inspired by the music that poured out of Tall Heights’ car speakers during the long drives from show to show. The guys found themselves listening to a wide array of sounds as they hurtled across the country, but they zeroed in on Icelandic music, taking influence from the sonic sweep of Sigur R&ocute;s and the electronic percussion of Ásgeir. The music of Iceland’s underground was deep, dark and cinematic, able not only to deliver a melody, but to cast a mood, too. Harrington and Wright were also influenced by their hometown Boston music scene, specifically their friends and peers in Darlingside and the Ballroom Thieves. Months later, while recording their own EP, Tall Heights used all of it as inspiration, and allowed their intimate indie-folk to grow into something bigger and bolder. It was a natural growth — the sound of two musicians amplifying their music to its fullest potential, exploring some new territory along the way. Holding On, Holding Out also draws a line between humans’ relationships with each other and their environment. It’s a call to be more present and conscious, especially with things we all hold dear — family, love, our planet — are at stake. At its core, though, Holding On, Holding Out is a blast of exploration and electricity from a group that previously did some of its best work unplugged. It’s progressive and propulsive, shining a light not only on where Tall Heights have been before, but where they’re going. 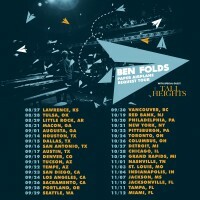 Tall Heights will be hitting the road this fall with Ben Folds! See the full list of dates here. Check out the new music video for “Horse to Water” from Tall Heights, directed by Matt Mahurin! Check the artist links for releases from this artist. United For Opportunity provides strategic vision and services that empower independent, motivated, career-oriented artists and labels to grow, manage, and fund the future. © 2019 United For Opportunity.